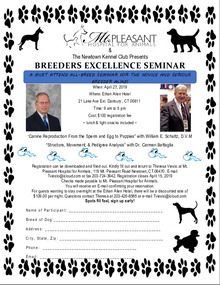 A must attend all-breed seminar for the novice and serious breeder alike! Hurry, spots fill fast so sign up early! Registration forms can be downloaded and filled out or click here to register online. Welcome to Mt. Pleasant Hospital for Animals! We know that your pet is your best friend. Or maybe your furry child. With that in mind, our commitment to service is unparalleled in the industry. Read more about us and our commitment to our clients. Our team of professionals, from the receptionist that takes your phone call to the veterinarians that make the final diagnosis, we are here to help you and your pet. Read more about our professional staff. From cats and dogs to exotic pets, we provide a variety of services for any and all pets. Read more about our services. We provide a variety of reproductive and neonatal care services. We also have a canine rehabilitation program. Ask for details! We are able to treat your exotic pet. We are constantly working to improve our customer experience. Please feel free to read our browse testimonials. We love pets as much as you do. See our photograph gallery. With a great location and convenient hours, we look forward to seeing you soon. Contact us today for more information or to schedule an appointment. As a center for canine reproduction, we will always do our BEST to be available to you for emergency c-sections or whelping no matter what the time or circumstance, as long as PRIOR NOTICE of a possible need is given during normal business hours. Although we have a wonderful and accommodating staff, there are rare occasions when we are unable to pull our staff together at odd hours due to sickness, weather conditions, continuing education, etc. We therefore suggest calling our hospital and speaking to the veterinarian on call to formulate a plan in case of emergency. Appointments may be scheduled outside of the hospital’s regular office hours for procedures that cannot wait. These should be scheduled directly with Dr. Vali or Dr. Bakewell on an as needed basis.